Because Aim-Smart runs within Microsoft Excel, many people ask me how well Aim-Smart performs. 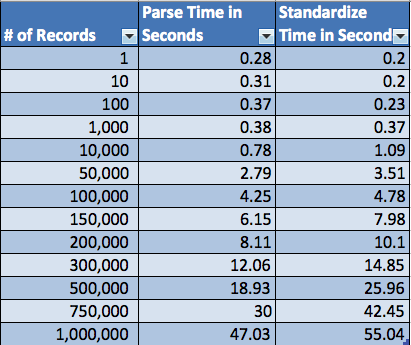 I’ve written a blog about Smart Match performance, but today I’m sharing performance statistics on Smart Parse and Smart Standardize. 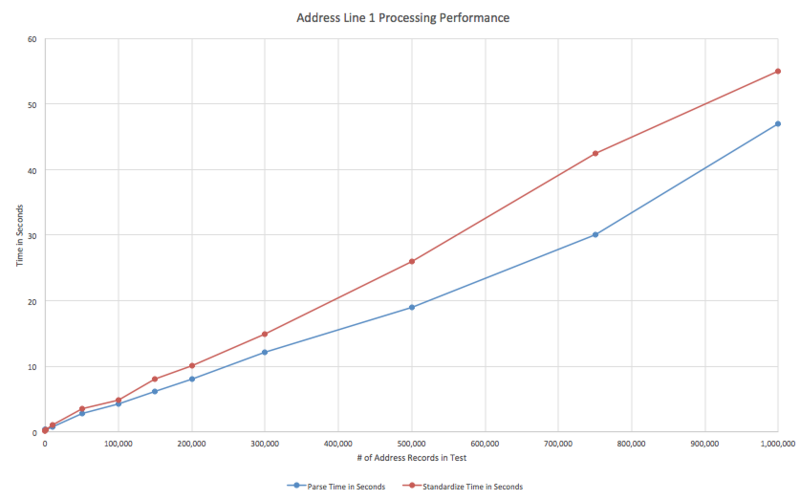 For the test, I used several sets of real US addresses, making test cases of 1, 10, 100… and up to 1 million records (close to the limits of Excel). You can see the results in the table below. I also graphed the results to show the linear behavior of the two functions. As you can see, performance is very, very good. As shown, Aim-Smart parses 1 million records in just 47 seconds. Smart Standardize runs on 1 million records in a similar time – 55 seconds. I chose to parse and standardize address line 1 for this test because it is more complex than most data types (such as name or phone). Despite the additional complexity performance is still very nice. The tests were performed on a Windows 8 laptop with 8GB of memory, an i7 Intel CPU (2.4Ghz) and a Samsung 850 EVO solid-state drive. Although the laptop has several CPU cores, only one of them is used by the system at any given time, allowing the laptop to continue to be responsive – and therefore useful – for additional tasks such as checking email, etc.